I have a short essay in the next issue of Time magazine (it will be online a week later) looking at the historical career of the American paperboy. Due to the vicissitudes of publishing, the piece had to be rather severely cut, but here is the longer, original version. Walking downstairs the other morning to retrieve the newspaper, I realized I was the last person in my Brooklyn apartment receiving the daily New York Times and Wall Street Journal. The number swells a bit on weekends, but Monday through Friday find me alone in my ritual. Trudging back through the snow, thinking about the future of this physical object and its delivery, I suddenly wondered: Were there any paperboys left in America? Certainly not on my block: The Times shifted to all-adult carriers over a decade ago. Mine wasn’t the image of Norman Rockwell and Leave it to Beaver — a boy on a bike — but a guy in a van from Staten Island. But did this once familiar cultural icon still exist? Where had he gone? And why should we care? The paperboy has been subject to two distinct forces. The first is the newspaper business: Not just circulation — which peaked in 2000 and has been dropping since — but when papers were delivered. 2000 marked the first time there were more morning than evening papers. This helped accelerate a shift begun a decade previously, when from 1980 to 1990, the number of adult carriers had risen by 112 percent, while youth carriers had dropped by 60. Most children either could not or were not willing to get up and deliver papers by 6 a.m. Cost-conscious newspapers shifted to large “distribution centers,” meaning carriers needed to distribute bigger bundles of papers across a wider area — via car. 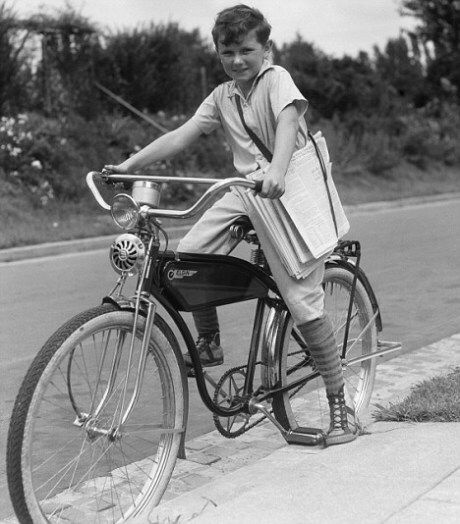 To entice adults, newspapers changed the name: The “paperboy” became an “independent delivery contractor.” They changed the job: Few carriers today do collections. And they changed the delivery experience: In what’s referred to as the “controversial tube-vs.-porch delivery dilemma,” instead of a kid putting it on your porch (or in the bushes), an adult in a car would put it in your roadside mailbox. People also began moving to exurban regions that were simply too spread out for kids on foot or on Scwhinn Stingrays, where streets were deemed unsafe for anything but the inside of a car (even if that’s where most accidental injury occurs to children, as Skenazy notes). From 1981 to 1997 youth participation in organized sports doubled; where nearly half of 16 year-olds had a summer job in 1978, just above 20% did by 2008. But so what? Why should we lament the passing of an entry-level, low-skilled job? Do jobs for kids actually do any good? Interestingly, Bureau of Labor Statistics research shows that men who worked in high school earned more than a dollar more on average at age 27 than those who did not. Was it the job, or were those kids simply more motivated? History teases suggestively: Benjamin Franklin delivered The Boston Gazette, Thomas Edison sold papers at the age of 12, and Warren Buffet, long before he was trying to buy the Washington Post, was delivering it. After these ruminations, I was admittedly pleased to find that there are still paperboys — and girls — in America (even if, in 2008, they made up only 13.2% of all carriers, down from nearly 70% in 1990). As Fred Masenheimer, publisher of The Times News, a newspaper with roughly 14,000 subscribers (“in central eastern Pennsylvania, just north of Allentown”) told me, the daily paper not only employs an all-youth carrier force — it’s resisted shifting to morning distribution precisely so it could keep those carriers. “I think it’s a vital part of a kid’s growing up and learning to be their own business person,” say Masenheimer. About half of the paper’s 100-plus carriers deliver papers alone, while the rest have parental supervision — particularly younger children. This is partially for safety, partly to ensure delivery. “When you put your reputation o the back of a 10 or 12 year old kid, you want to make sure that they’re doing the job properly,” he says. In 41 years of publishing the paper, he’s seen countless carriers go on to college, or routes change hands several times within the same family. This entry was posted on Friday, February 4th, 2011 at 9:14 am	and is filed under Uncategorized. You can follow any responses to this entry through the RSS 2.0 feed. Both comments and pings are currently closed.